Rob instructs in the sea kayaking program. 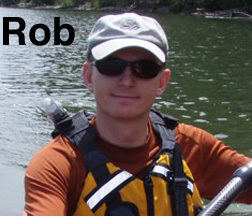 Rob’s love of the outdoors led him to guiding and instructing in a variety of outdoor pursuits over the last 20 years. He has a particular passion for sea kayaking. Rob thoroughly enjoys the many different aspects of sea kayaking including leisurely day trips, multi-day tours, rock gardening and rough water paddling. He is a sea kayak instructor with Paddle Canada and also has diverse professional outdoor certifications. When not paddling on the west coast or closer to home he can be found ski mountaineering, scrambling, backpacking, or standing in the dark alone staring at the stars.